The big news for '07 is the availability of a three-piece (including the glass section) retractable hardtop option for Mazda's legendary two-seat sports car. Even better, the trunk won't disappear when the top is dropped. When the hardtop is retracted and folded away, the Miata still has 5.3 cubic feet of trunk space—more than enough for the typical overnight bag. Also, choosing the retractable hardtop won't weigh the car down too much. 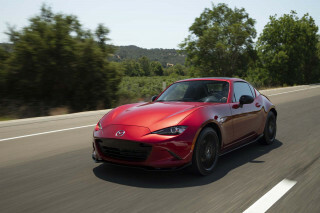 This version of the Miata comes in just 80 pounds heavier than the standard soft-top roadster. Minor exterior sheetmetal changes are also visited upon models with the retractable hardtop option, including a steel trunk lid (in place of the standard car's aluminum piece) and some detail touches to integrate the lines of the retractable top into the overall theme. In addition, two new exterior colors—Stormy Blue Mica and Highland Green Mica—replace Winning Blue Metallic and Nordic Green Mica. Copper Red Mica, Galaxy Grey Mica, Sunlight Silver Metallic, True Red, and Brilliant Black are also offered. 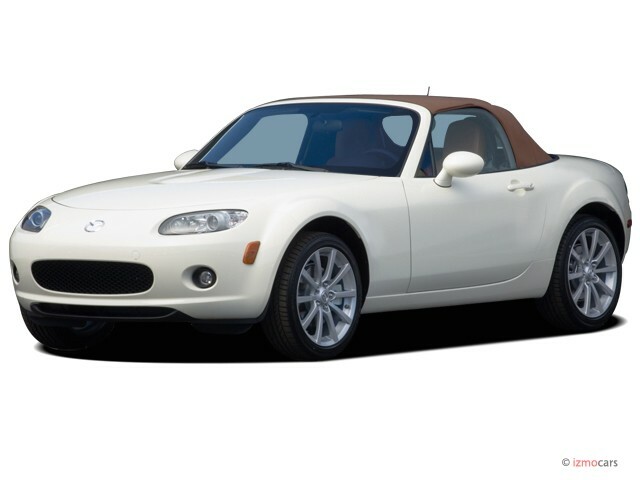 Three interior packages—black fabric, black leather, and saddle-tan leather—carry over from the MX-5 soft top as do the Miata's powertrains and major options.